With all of Amorphis‘ shows this summer, we felt rather ashamed that we hadn’t done a single interview with them… ever. 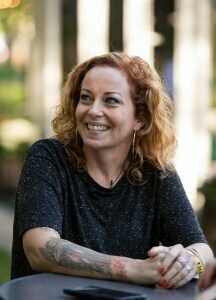 So when the ‘An Evening with Friends’ show was announced with Anneke van Giersbergen as a guest, we thought it was only fitting that we try and catch them together! 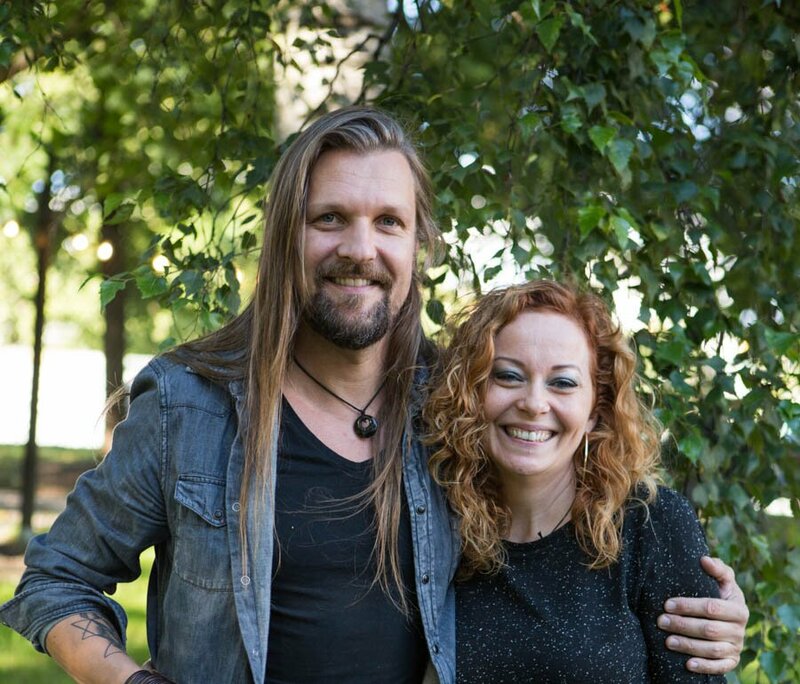 Here is our interview from the Helsingin Juhlaviikot (Helsinki Party-Weeks) festival, featuring Esa Holopainen and Anneke van Giersbergen! First of all, how did the acoustic gig from a couple of days ago go? Anneke: Very good. Actually, because I was here just like… a week ago [laughs]. 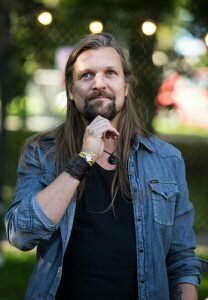 Only a couple of months [ago] and when Jouni [Markkanen] said we can do a gig before the big Amorphis gig, I said, “Well yeah, but I’ve just been here and who’s going to come over?” Then it was sold out in a few days. I was so happy. It was really nice. Really, really, really friendly crowds, as always. And I had Esa join me, so it was super special. Was that gig originally meant to be just you, or was Esa planning to play with you the whole time? Anneke: It was kind of my gig, but then we said… because we are going to play together today. So where did the idea for this special Under the Red Cloud show come from? Esa: It actually came from the cultural people in Helsinki. 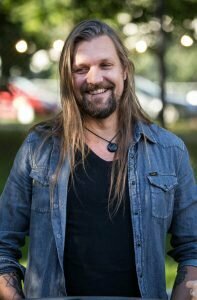 Lauri Porra, one of the guys who’s a musician himself, he’s working there… he asked if Amorphis would be interested to do some kind of production here, and then we just started to think about what kind of production. We wanted to play the new album as a whole and then think about doing another set with guests. That was then, when Anneke was in Helsinki last time playing the show in Semifinal. Esa: Then we talked about if she’d be interested. Anneke: And of course I said yes within one second. Esa: That was great! And then Sakari [Kukko] who is playing flute and saxophone, we’ve been working with him on many albums and he’s been touring with us with some acoustic stuff. And Pekko Käppi, we didn’t know him before. Well, we knew that he plays the jouhikko [traditional Finnish bowed lyre]. It’s a traditional Finnish instrument and it sounds super cool. We definitely wanted to include him. And we didn’t have any idea how it would work for Amorphis’ music, but now that we heard him playing… actually for the first time yesterday. Esa: Yeah! It sounded really nice. Anneke: It sounded like he’s done it all the time. It’s great. Esa: He’s got a little bit of a different approach to that instrument. It’s electric and he runs it through distorted pedals and whatever, so it sounds a bit modern. Like us! [laughter] Not! Well, you’ve basically answered my next question right there. Now Anneke, we did an interview with you before your last show at Semifinal, and at that point you mentioned that you are a big fan of Under the Red Cloud. How did you guys end up deciding to collaborate for this particular show? Anneke: The thing is, I’m not even singing a song off that album, but we just came together, like Esa said, when we were at the gig and I asked Esa to come over and see the show as a friend, and so we went to dinner and we met with Jouni, the manager, and then probably they came up with the idea to ask me. Anneke: And usually that’s how it goes. You meet up and you always see each other everywhere and spontaneous stuff happens. So you’re not singing the Under the Red Cloud songs tonight? Anneke: Nope. But I love the album. I play it all the time. It was one of Musicalypse’s collective favorite album of 2015. Absolutely! And what is your [Esa] opinion on the album now that it’s been out for nearly a year and you’ve been rehearsing the whole thing for this show? 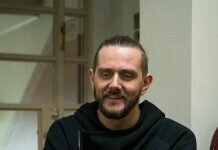 Esa: I still think it’s a kind of fresh album, even though we’ve played a lot of shows with it and we’re still going to do quite a lot of shows. We don’t have any plans for the next album for a year now or something. The tour still, in a way, continues. Yeah, what can I say? I really love to play the songs live and now it’s really nice that we have a chance to play a couple songs that we haven’t played before at this show. So probably some of those tracks we’ll take for the setlist, but it’s great. Great fun! I guess every musician knows that you have your old classics, and when you do those it’s like, ‘yeaah’… but then it’s more fun when you play the new stuff and see that people enjoy it. You guys have been playing so many shows this summer – have you been using them as an opportunity to practice for this show, or have you been sticking with a set Under the Red Cloud -tour setlist? Esa: Yeah, no. Usually what we do is… well, we don’t rehearse that much. If we go on tour or festivals we do a couple different sets and we add a bit. Now we had to rehearse for this show, those tracks that we haven’t played before and some of the older tracks we haven’t played for a long time. What are your expectations for the improvised part of the show? Is it scary at all, or exciting…? Esa: I think it’s both. You have to have a structure that you follow, but I think it’s always good if you have a little danger in the air [laughs] and you don’t know what’s going to happen. And when you improvise something or improvising happens, when it’s very natural, it moves very naturally to another part, then it’s great. But there’s also danger. You can collapse the whole song by improvising too much. Or if the other guys are not following what you do all the way. It’ll be interesting if nothing else! Does this collaboration between you open the doors for a potential official album collaboration in the future? Anneke: Well, we played together and it went really well, and usually when something is going well and it feels good, you say, “Let’s do something real together.” Now it was also a little bit spontaneous, and then we WhatsApped, “Can you do this song? Okay, can you do that song?” and then we rehearsed for 3 milliseconds, and we did the two songs. But when that goes well, it calls for ‘let’s do something serious.’ But you never know when it’s going to happen because it’s always busy. But I’d love to. At least play live together. Esa: Yeah, I think probably when we’ll start to do the next album, we will call you. [laughter] You never know. Now, Elegy is celebrating its 20th anniversary this year, but you guys are playing a tour for the 10th anniversary of Eclipse instead. Was there any specific reason you picked Eclipse over Elegy? Esa: Not really, no. We actually did Eclipse once in Savonlinna in the opera festival a couple years ago and it worked out really, really nicely. We thought about doing Elegy as well, but we might do that later. [laughs] But this time I think it felt right to do… we wanted to do Eclipse and include a few of the songs from Skyforger and Silent Waters that we haven’t played for a long time. To have a little bit more of a special set. 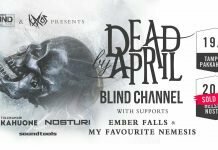 Have you seen much of an increase in your popularity in Europe – for example, in the number of people coming to shows – since you’ve toured with Nightwish? What was it like to open for Black Sabbath at Monsters of Rock? Esa: Yeah. It was a great experience. Of course, opening for bands like Black Sabbath and Metallica and Iron Maiden, it’s a task, because people usually go there to watch the main band. But it was great feedback and a great experience. You guys have quite a list of classic metal bands that you’ve opened for now, which is pretty cool. Esa: It’s a great personal thing to remember. I don’t know if it helps anything, but at least you can say, [goofy voice] “Hey, I opened for Black Sabbath!” [laughter] Pretty cool, huh? Anneke: It’s pretty cool because you grow up with that stuff, you know? Esa: That’s the thing probably. It’s more than just opening for the big names. Usually those guys are your personal heroes and the music that you grew up with. Did you get to meet any of them backstage? For you, Anneke, are you and Kari Rueslåtten and Liv Kristine planning on doing any more shows together, or are The Sirens officially finished now? Anneke: No, that project is all done now. We knew it was going to have a beginning and an end. We should’ve done the Nightwish festival [in Jämsä]. That should’ve been our last show together but that didn’t happen because of organizational reasons. But yeah, everybody’s going their own way. I myself, personally, feel that I have so many projects going on that it’s too much, and I’m working on an album and I want to commit myself totally to that, so everything else is now on the back-burner. So The Sirens are done. But I have great, great memories. I’m really fond of what we did. What’s your favorite song off Transcendence? Anneke: I’m not sure yet, because I just got the album and I downloaded it, because Devin sent it to me, and I didn’t hear everything properly yet. I played it a few times in the car and then you can’t really tell. Of course, I love, love, love everything he does, you know. There’s a few songs that I’m on that I’m really proud to be on, because they are really, really cool songs, but again he’s so melodic and he’s so honest and he’s so heavy at the same time. I love it. It’s a lot of good energy. So I’m over the moon and I’m going to sing a few of those songs at the festival… what’s it called… Prog Power USA! So I’m going to sing with Devin a couple of those for the first time. It’s going to be good! Any chance you’ll be doing any shows on the Transcendence Tour? Anneke: I don’t know. Maybe! Because he’s coming to Holland and it’s usually the same thing. “Are you in town?” Or not. Maybe I’ll just go watch. We never really make a big plan. Also, because I’m touring and doing everything. I’d love to do a tour with my band and Devin… I’ll sing for him whenever he wants. That would be smashing, really, to get our bands together. I’m still waiting for the acoustic Anneke-Devin tour. That’s on my bucket list of things to see before I die. Well, thank you both so much for your time, and have a great show!